With pumpkin spice lattes and fresh apple pies comes another fall favorite: roasted veggies and meats. Harking to memories of juicy morsels with a crisp, sweet shell, roasting is a fan favorite for many Americans. If you haven’t already invested in a roaster, now is the perfect time to add this essential to your kitchen lineup. Not only are roasted items a shoo-in for any menu, but you’ll likely boost your profits during the fall and winter seasons with hearty, roasted dishes! When working with your roaster, here are some essential tools to add to your lineup. 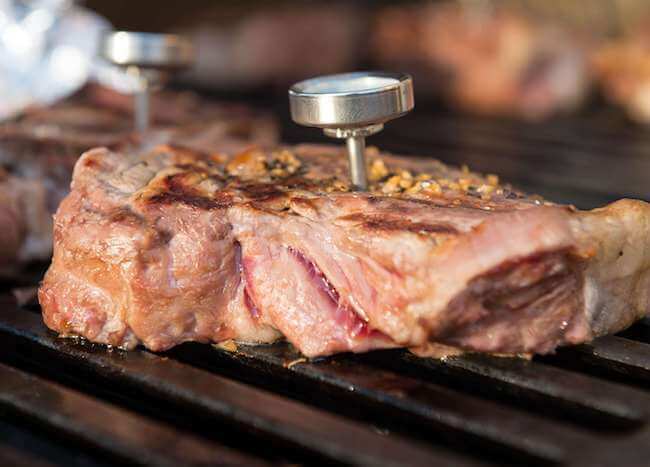 Meat Thermometer: One of the trickier parts of roasting meats is knowing when enough is enough, and you can’t truly know unless you measure the internal temperature with a meat thermomete. Every roaster is a little different, so it’s recommended that until you get the hang of things, check the temperature of your product just before the cooking time is up. Insert the thermometer into the thickest part of the roast while avoiding the bone, as this can throw off your thermometer reading. Always clean your thermometer after use and store it in a dry area. You can also check for accuracy on occasion by immersing in an ice bath (32 degrees). Baking Sheets and Roasting Pans: Roasting pans are essential to creating a juicy roast because of their 2 ½ inch sides, but baking pans are also recommended. While these may seem opposite to the deep roasting pans you’re accustomed to, shallow, heavy-duty baking sheets are perfect for capturing juice runoff while allowing air to circulate through the roaster. Food is able to brown more readily, as more sides are exposed. You can also roast veggies on a baking sheet as well! We suggest 16 gauge sheet pans over 18 gauge which warps over time and leaves you with an uneven bottom. Skillet: Low to moderate roasting heat produces a succulent, juicy roast, but the downside is that you may lose some of the brownings that gives roast that crispy shell. The solution is to sear the roast in a cast iron skillet before you place it in the roaster! Remember that this may also shave some time off of the roasting bit, so use that handy meat thermometer to ensure that you don’t overcook. For cast iron care, always dry it thoroughly before storing, and never use soap to clean it. Carving Board: Roasts work great for carving stations, but they also expel a lot of juice. Be sure to allow your roast to set after you pull it from the roaster to keep juices from gushing. You’ll still have some drainage, so invest in a carving board with a channel that runs around the perimeter to catch any juice that may try to make its way to the floor or countertop. Roasting Rack: Obviously you won’t be using a rack to lift veggies, but roasting racks can come in handy for large pieces of meat. It allows for air to circulate completely around the product, and it prevents poultry skin from sticking to the pan. The drippings fall into the pan below and can then be used for gravies, brines, or any other type of sauce! Just be sure to add water, wine, or broth if the drippings seem like they’re drying and beginning to burn. Serrated Cutlery: An obvious essential, serrated cutlery is the key to getting the perfect slice off of your roast every time. Also consider a motorized slicer after you’ve roasted meats, as the slices make great sandwiches. Keep these roasting essentials stocked in your kitchen for all of your roasting needs!